In our earlier posts we touched upon the fact that chatbots aren’t that new. Yet there is novelty in their scope and application and with that, several new business problems arise. Where we previously discussed managing a large inventory of business critical bots (see examples listed in our previous blog) the focus of this post will be on the successful migration of such an inventory. The notion of migration in this context captures moving enterprise chatbots connected to a deprecating chat platform over, to connect to a newer chat platform where the users are homed, effectively placing the craftsman and the tools in the same environment. This specific migration consists of an inventory consisting of over 5000 chatbots, each of which have their own assigned business functions, and without them business would cease to function as expected, or altogether. The chatbot migration discussed in this post is that of a global investment bank, which cannot be named here. As the bank’s users are ushered onto a new chat platform the bots couldn’t be left behind and consequently had to be moved onto the new system as quickly and smoothly as possible. Considering these principles, a migration could not be avoided and would have to be expedited to digitally transform the business and maintain a competitive edge. The chatbots, in their 1000s, each with their own configuration and each one business-critical would have to work against the new system, just as they did against the old system. To complicate matters there are a multitude of factors in play, not all chatbots are married to the same platform, written in the same language or connect the same way. In short, an IT endeavour of this magnitude carries immense risk and has potentially crippling consequences for the business if not approached diligently. With the above in mind, MindLink Software became an increasingly obvious choice to execute this project. With longstanding experience and reputation in the field of unified communications, particularly with Microsoft systems and expertise in the migration and implementation of enterprise chatbots, MindLink was the likely candidate to plan and execute this enormous project. As part of this professional services engagement MindLink identified several key risk components that would have to be taken into account and dealt with. Many bots each with individual configurations all have to preserved. Time constraints, users have already transitioned onto newer platforms but still require chatbots homed on older platforms. Turnaround time & cost, the project would have to be completed timely and as cost-effectively as possible. Business continuity, the bank requires to continue business as usual and the project must have a minimum impact on the business and its employees. Rollback plan, should anything go wrong services will need to be restored for business continuity. To address the above, MindLink planned out every inch of the migration in minute detail ensuring the risk across these areas was minimal. 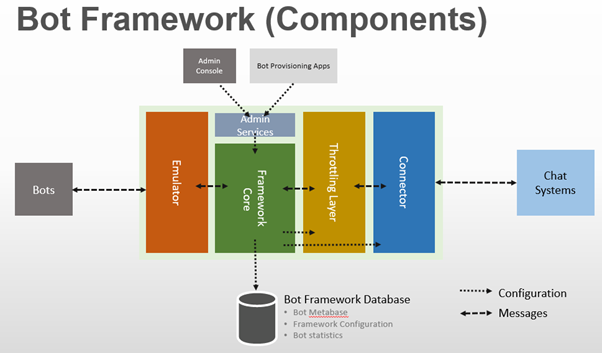 With all of the moving parts presented in this problem (different chatbots, different configurations, different platforms) it’s easy to get lost in the inner workings of each part, which demands a high-level perspective. Zooming out and looking at the project in its entirety the chatbots would have to be unplugged, moved, and finally hooked onto the new system and at the flip of a switch everything would work once again against the new system. A basic approach would be to phase the migration one chatbot at a time, meaning; rewrite all 5000 chatbots against the APIs of the new chat system, now although this is possible, it certainly isn’t very practical. This approach would be a lengthy and costly exercise that requires full knowledge transparency about the behaviour of individual bots. As individual chatbots carry differing configurations and are connected to different legacy platforms not all chatbots are equal in the way they are dealt with in this migration project. But what if they could at least appear to be, to some extent? Built in house as a result of lessons learned derived from past migrations, MindLink have leveraged this tool to ensure successful chatbot migrations across a multitude of chat platforms. By homogenizing chatbots through an emulation layer allows chatbots to become agnostic to the destination platform which reduces the complexity of the migration. Supported chatbots now only need to work against the emulator, provided the emulator supports the destination platform, without having to change chatbots individually prior to the migration. The significance of this tool arises from business continuity, in the sense that it also allows the chatbots to maintain operations during the migration phase. The connector depicted in the diagram is able to function in two modes: 1) Simple, 2) Hybrid. Simple allows the chatbots to communicate/integrate with the new chat platform whereas Hybrid allows the chatbots to talk to multiple systems simultaneously. Whilst the migration is taking place, the bots continue to talk to the legacy systems in use, whilst gradually surfacing in the new system, eliminating downtime for the users and promoting business continuity. Chatbots and configurations remain unchanged due to emulation practices in play preserving chatbots in their original state/condition. Chatbots were accessible to users on both legacy and modern chat platforms during the migration phase eliminating time constraints on the change window. By eliminating the need to test chatbots individually the process was expedited resulting in cost savings. With chatbot services available throughout the migration there was virtually no downtime for the users, promoting business continuity. As the bots are unchanged, in the event of a failure, changes can be rolled back and the bots would continue to work against the legacy system. With the plan in place and the risks accounted for all that remained was a swift and seamless execution. The migration tool is capable of processing over 165 bots per hour, totalling a mere 30 hours for the entire migration of the chatbot inventory. After the successful completion of the migration it’s back to business as usual for the investment bank although, to the users, the migration never quite resulted in anything unusual to begin with. Need help with your enterprise chatbots? Get in touch! MindLink Software consists of a team of Unified Communications (UC) experts, specialising particularly in Microsoft systems such as Skype for Business and Lync. We have a longstanding reputation within our field and have successfully delivered consultancy, implementation and migration services. Consequently, some of our solutions arising from professional services have become products of their own. If you have a UC problem, MindLink will solve it.